Looking for the best blender for salsa? Which features are important for salsa making. The pros and cons of each blender. Although it’s a weaker blender, it’s design is perfect for salsa. In fact, that’s kind of it’s claim to fame. Just put the ingredients in and pulse a few times. It’s as easy as that with very little clean up. This is a powerhouse with a gentle touch. Because of it’s variable speeds, pulse function and tamper, you can make chunky salsa without completely pulverizing ingredients. And of course, you can do so much more because it’s a Vitamix. Designed to double-function as a food processor, the wide container and chopping-style blades are perfect for mastering salsa. It’s a bit more powerful than the magic bullet making it more versatile for smoothies and other things you might want to bland. It’s also got a small cup which makes it easy to pulse up small batches of salsa. The Explorian is a great smaller alternative to a typical Vitamix that’s got all the same functionality. If the 750 is out of your price range, this is one you may want to check out. It’s got all the same critical salsa functions as the 750: Pulse, variable speeds and a tamper. PS: If you don’t have the budget for any of these — https://thrivecuisine.com/kitchen-appliances/blenders/best-immersion-blenders/”>immersions are also great for sauces! Here are all of the blender features that I feel are important for salsa making. However, it is not critical that your blender has all of them. They can also be mutually exclusive, but understanding them goes a long way to figuring out your final decision. Variable speed control is a critical element for getting salsa to be the texture you want it. If your blender just goes on one high speed, it's going to turn the ingredients into mush. Brands like Vitamix have some form of variable speed control, usually in the form of a knob or dial. You generally want to keep things on the lowest setting if you want to keep your soft ingredients chunky. Technically speaking, most blenders can pulse. It's simply a matter of turning it on and turning it off. However, a dedicated pulse feature makes the process easier. The purpose of pulsing is to do quick blade rotations with pauses in between rather than running the blades continuously. This prevents a vortex from forming which would liquefy your tomatoes and onions. A tamper, which is found on all Vitamix blenders, is a device that you stick in the top of the blender that pushes the ingredients into the blades. A tatmper being used in the salsa making process. It's a great feature to have for salsa because blending on low often times isn't powerful enough to bring the ingredients at the top down towards the blades. For example, If you have a bunch of chopped tomatoes at the bottom, it helps to use the tamper to push the bigger pieces down from the top. This results in a more uniform salsa rather than having chunks of all different sizes. If you can't afford one of the blenders with variable speeds, a blender with a weaker motor can actually make salsa-making easier! You're less likely to over-process and mixture and create a tomato soup if the blender is weak. That's why I included products like the Magic Bullet on this list. It's not deal for heavy duty blending, but perfect for salsa making. The Magic Bullet is pretty much designed for making salsa and chunky dips. The small cup that it comes with is the perfect size to make a dip for one or two people. Because of the tiny stature, it's far easier to get the ingredients to the blades when you pulse. This became my first pick because it is accessible to almost anyone who is looking to make salsa. With it's small size and low price range, it's a much smaller commitment than some of the bigger blenders. Accessories: It comes with tons of accessories which make it really versatile. 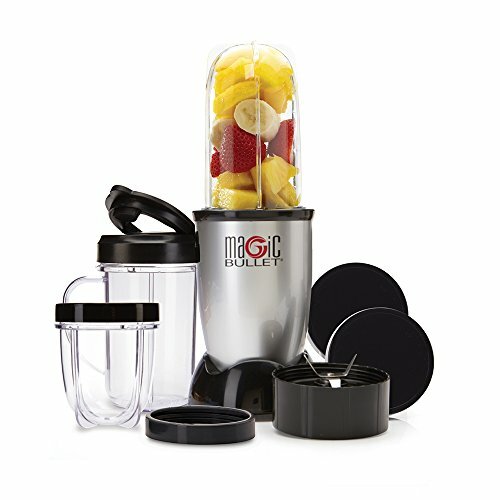 Lids, different sized cups, and rims all make it a solid "on-the-go" blender. Easy to Store: The small size means you can make your salsa, slap a lid on it and put it right in the fridge. The base-motor part will fit easily in or under cabinets. 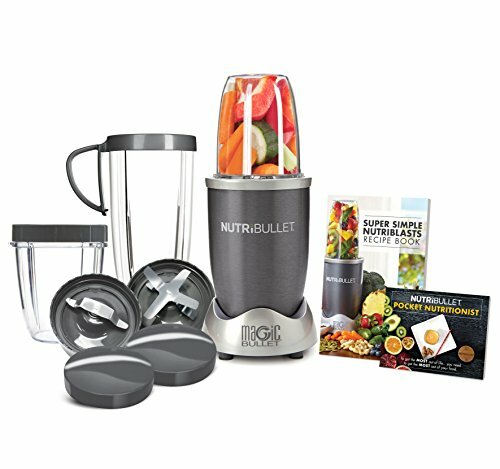 Long Warranty: Compared to the higher-tier blenders, the the Magic Bullet has a really short warranty - only a year long. Lacks Power: Don't expect to make silky smooth blends like you would in a Vitamix or even a Nutribullet. Some might consider this blender to be overkill for making just salsa, and they would be right. You absolutely do not need a powerful Vitamix to make decent salsa in a blender. However, it was worth including on this list because it can make salsa in addition to doing almost any other blending task you can imagine. How do you make salsa in this thing without making a soup? Simple! Use the pulse function on the lowest speed along with the tamper. Unless you turn up the power, the ingredients will remain chunky yet chopped. This unit is especially great if you're entertaining large crowds. You could also consider a less flashy model like the Vitamix 5300 or the Vitamix 780 if you want a touchscreen interface. Warranty: The 7-year Vitamix warranty cannot be beat. I have had several personal interactions with their support team for my Vitamix and they never let me down. This is an investment, but it's well worth it. This is the one of the reasons why Vitamix blenders are pricey. Power: The 750 is poweful enough to do almost anything you want. Smoothies will be completely smooth and thick. Nut butters and spreads are a breeze. Hot Soups: The venting on the blender jar and high speeds make simple to make hot soups right inside the blender. No need for a stove. 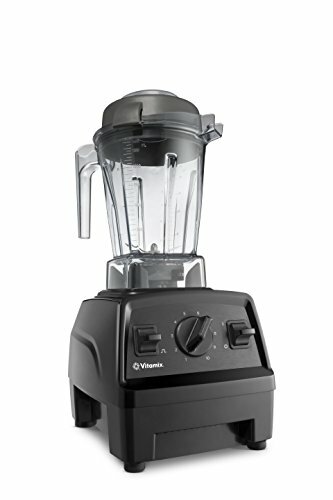 Affordability: Yes - it's a Vitamix so it runs a lot higher in price than some of the cheaper blenders. Bulky: While it's great for serving multiple people, it does take up a bit of space on the counter top and in your cabinets. It's almost as if the Nutri Ninja NutriBowl was designed for salsas. It's got a wide 4-cup bowl which makes the unit double function as a blender and a food processor. Food processors are notoriously better at making salsa than blenders are. Small but powerful: At 1200 watts, it's extremely powerful for it's size which mean that your smoothies will be smooth. Bowl and Cups: The bowl is great for food processing while the cups mean you can take drinks on the go and make pourable sauces. Dual-Blades for Chopping: The food processing blades are a set of two blades rather than one. Normally I don't like this type of thing for regular blending tasks, but for salsa it's great at chopping. 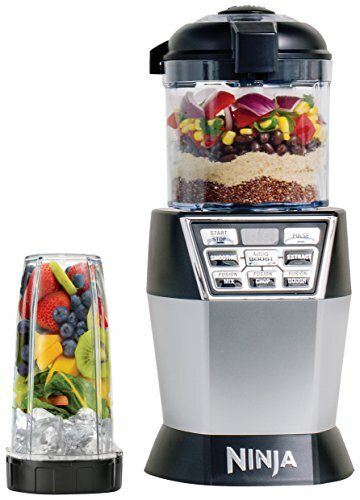 Short Warranty: A one year warranty is decent for the price range, but it's inferior to a Vitamix or Blendtec. The Nutribullet 600 is weaker than the Nutribullet Pro which I use and love, but it's perfect for salsas. It also comes with a small cup which makes it easier for the tomatoes, onions, and peppers to make it to the blades. Read Also: What's the Best Nutribullet Blender? Easy to Store After Blending: After you make your salsa, it's easy to throw it in the fridge with the included caps. Easy Pulse: By pressing down on the blender, you can do quick pulses which are great for chopping salsa ingredients. Easy to Use: No fancy buttons, just click it on and go. It's one of the most convenient blenders around. Weak Motor: It's not going to be the best for power-heavy blending tasks like really thick smoothies. You can still get away with thinner blends, though. Short Warranty: Warranty isn't great -- only a year long. The Vitamix E310 Explorian has the same salsa making functionality as the Professional 750 does. On the upside, it tends to run a bit cheaper and isn't as bulky. It's the perfect compromise and the ideal unit for someone that doesn't have much storage space. It was one of our top picks in our blenders for cashew cream guide. Has all the great things about a Vitamix, but just a little bit smaller -- great if you have a bit less room or are blending for one person. With the variable speed, tamperand pulse feature which means that making salsa in the E310 is a breeze. Powerful enough to do almost any blend you can think of with ease, including making hot soup right in the container! Shorter warranty than the typical 7-year one that comes with a Vitamix. It's still well-worth the investment, though. There are plenty of different blenders that are capable of making salsa. For something quick and easy, The Magic Bullet or Nutri Ninja Bowl Duo are great picks. Just remember the speed control, tampers, and ability to pulse makes it a whole lot easier to make salsa and everything else. 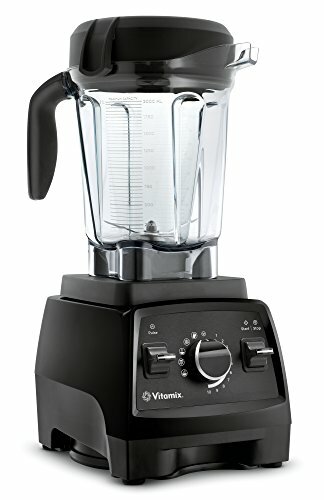 If the The Vitamix 750 is within your budget – then I highly recommend getting it (or any Vitamix besides the those in the S-Series). Whichever one you pick from this list, I’m confident that you’ll be happy.